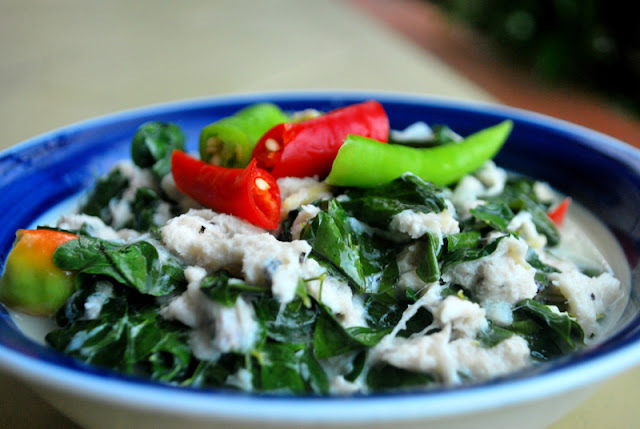 Flavourful spicy Bicolano recipe, like the famous laing and bicol express. A spicy dish recipe wherein stingray, Sharks or crabs cook in coconut cream, malunggay leaves and spicy chilli. 1. Clean the stingrays thoroughly and blanch in boiling water for one minute. 2. When cool, remove skin and cut into quarters. 3. Bring 1.5 liters of water to the boil, add the whole onion, celery, bay leaf and peppercorns and boil for 3 mins. Add the quartered fish and simmer for at least another 3 mins. Remove fish, scrape off meat with a spoon and set aside. 4. Heat the oil in a pan and sauté the garlic for 2 mins. Add the chopped onion ginger, chili pepper and vinegar. Simmer for 10 mins. Add the stingray meat and cook further for 2 mins. 6. Adjust seasoning to taste and add the coconut cream. Bring to a boil and remove from heat. Transfer to a serving dish.